Bungee Run – What gets the crowd going more than a competitive race? How about a competitive race that has an extra edge to the competition especially if that includes 30 feet of nonstop physical exertion that will leave one of two runners completely victorious? 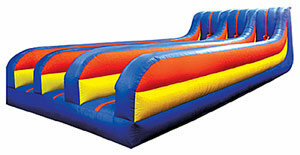 Get ready to run the About to Bounce Bungee Run Interactive. The About to Bounce Bungee Run Interactive truly tests one's strength. With the harness securely fastened around each runner, and a giant bungee cord giving ample pull in the opposite direction, it's a race to see who can get to the end of the line. Even one slip – and you'll be pulled right back to the start. Who wouldn't want to have a birthday party or special event that saw every guest clamoring with excitement to see who was about to win? Priced at $269.99 for a six hour rental, this is one stretch of energy and laughter that will give you a genuine run for the money.